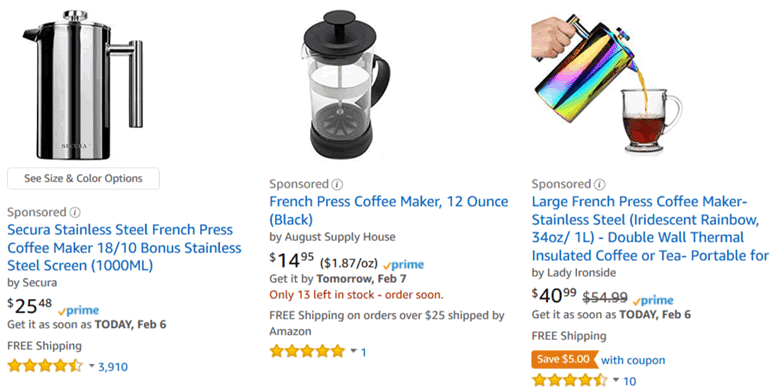 From costs and effectiveness to ACoS and optimization, Chris Rawlings answers all the big questions on Amazon Sponsored Products PPC ads. This post is by Chris Rawlings, CEO and Co-founder of Judolaunch and JudoPPC. Amazon is now the third-largest online advertising company in the U.S., earning an estimated $4.61 billion in ad sales last year, to place it behind only Google and Facebook. That shows on the site, with sponsored ads featuring at the top, middle and bottom of many search results pages. These are Amazon’s flagship PPC ads, Sponsored Products. 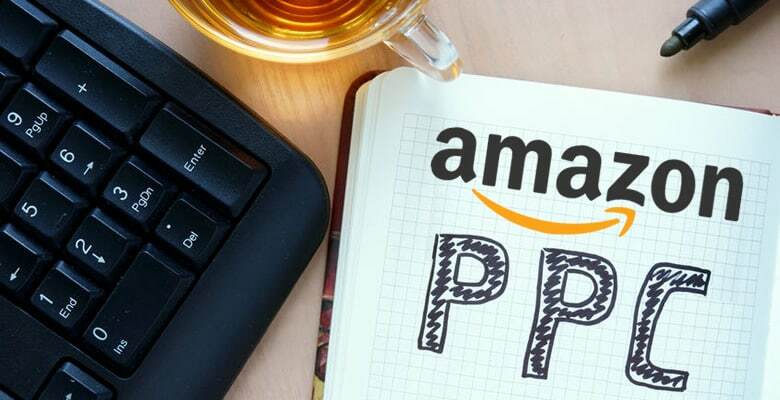 Amazon PPC ads are more popular than ever, and becoming almost indispensable for businesses to launch and sell their products successfully. Here’s everything you need to know about these ads. What is Amazon PPC advertising? Amazon PPC ads are Amazon’s in-house pay-per-click advertising program that displays advertisements within Amazon’s search engine results and product pages. Third party sellers, brands and manufacturers pay for these sponsored ads to promote their products or brand. The ads can only be placed by sellers with a professional selling account, or vendors using Vendor Central, and aren’t available for all product categories. The ads increase visibility and sales by appearing when shoppers are searching for similar products on Amazon. Pay-per-click means that the advertiser only pays for the ad after a potential customer clicks on it to view the product. What is the difference between Sponsored Products and Sponsored Brands? There are two main kinds of Amazon PPC ads: Sponsored Products and Sponsored Brands. Sponsored Products promote individual product listings, and Sponsored Brands promote collections of products within the same brand. With Sponsored Products ads, the seller picks the product, then either chooses their own keywords or lets Amazon do it automatically. The seller can control ad spending and keyword bids and monitor performance metrics of the campaign. Clicking on the ad takes you to a specific listing. Sponsored Products ads are displayed in search results or on product detail pages. Sponsored Brands (formerly Headline Search Ads) are larger ads that feature multiple products, the brand logo, and a custom headline. Clicking on the ad takes you to the brand page, store, or a landing page on Amazon. Sponsored Brands ads appear in high-visibility locations within search results: at the top of the page, at the bottom of the page but in a smaller format, or at the side of the browser window. Amazon PPC ads also appear on mobile searches, which is an increasing source of traffic every year. How much do Amazon PPC ads cost? Amazon PPC ads are variable in cost, depending on how much advertisers bid for keywords. You only pay when a shopper clicks on the ad. Every combination of product and keyword will have a different cost, depending on demand. There’s no set price, but generally it ranges from $0.05 per click for the least competitive keywords to sometimes $4.00 or more in the most competitive categories. Amazon is considered a very cost effective PPC platform when compared to Google AdWords and Facebook Ads, primarily because of high levels of purchasing intent. In other words, the people seeing Amazon PPC ads have often come to the platform to buy, and are therefore more likely to purchase the advertised product. On Google, the person seeing the ad might just be looking for product advice, and on Facebook they might be reading comments in a group they belong to. People on those platforms will still click the ads, but they are less likely to buy. When you’re running an Amazon PPC campaign, you have to set a daily budget. The minimum is $1.00, and recommended budgets can range from $10 to $75 a day and beyond. What you spend really depends on the product, the competition, and the cost of the keywords that you’re bidding on. A good rule of thumb that some people use to estimate costs is the “2.5 Rule”, which means that the cost per click for the keyword you are bidding on shouldn’t be more than 2.5% of the product’s selling price. This provides a reasonable guide, but does not guarantee success. Also bear in mind that PPC bids should not be treated as a “set and forget” project. Once you have some data on the keyword click-through rate (CTR) and how many clicks you need to make one sale, you can adjust the bid accordingly. Are Amazon PPC ads really worth it? Yes, they are. Along with being cheaper and more efficient than Google or Facebook Ads, you are getting your product in front of people who have come to Amazon to buy. Having that buyer intent is a big plus, and makes Amazon PPC more likely to increase sales and get your product ranked higher. With good strategy and effective management, Amazon PPC ads can be extraordinarily effective, especially when launching a new product. How does Amazon decide which ads to show and where? The position of a PPC ad in the search results is based on an auction system. Generally speaking, the seller with the highest bid gets the first position in the search results, the second-highest bidder gets second place, and so on. However, the highest bid does not always win the top position, as there are other contributing factors that Amazon takes into account. Amazon uses an internal ad display algorithm to determine which ads to show to shoppers, based on what they’re searching for when they visit the site. A product is considered to be relevant when the listing has the correct browser node (subcategory) assigned and includes relevant keywords. Campaign quality score is an in-house Amazon metric. The score is not displayed anywhere, as it is only for Amazon’s own use. But from our testing we believe that it takes into account click-through rate (CTR), total number of clicks, campaign age and other factors to judge the overall performance of the ad. The overall result is that ads which shoppers click more will be ranked higher in the results. Will PPC ads help me get more organic sales? Organic sales are sales which happen “naturally” through the normal search results – without an ad being clicked on first. Surprisingly, a good PPC ad campaign can definitely help drive organic sales as well. It does this in two main ways. First, using PPC provides Amazon with data showing that your product is relevant to specific keywords. This relevance is a factor in organic search ranking as well as the position of Sponsored Products ads (see the question above). An improved search ranking means more visibility, clicks and sales, which feed back into the algorithm and drive a yet higher ranking. Also, a successful PPC campaign will create sales, increasing your Best Sellers Rank (BSR) which also feeds back into the search algorithm and positively impacts your organic ranking. So, PPC is a great way in general to increase sales, and by doing so get more organic sales traffic as well. Should I get a lot of product reviews before starting Amazon PPC ads? For optimal results, having a minimum of 6 to 8 reviews is going to be very helpful when it comes to conversions. Reviews are social proof that you have a good product. Zero reviews can often equal zero sales. So, once you get some positive reviews in, the PPC will become much more effective. There is a different school of thought that’s more aggressive, which is to turn on PPC ads from day one of the listing. If that’s your approach, you would run an automatic campaign, so Amazon can help you discover relevant keywords. You will get some organic benefit from the PPC in terms of relevance, and you might get some sales to help bring in those first reviews. In general, though, you’re better off with a few reviews in your pocket before you begin advertising. Should I work on my listing before starting PPC ads? Yes, the best thing to do before starting Amazon PPC ads is to optimize your listing. Having your listing totally dialed in will really help convert more sales. Every click to your listing from your PPC advertising will be costing you money, so you should make your listing shine. High quality photos that show the product, its features, and its benefits. Keywords in the listing that match what you are using in your ad campaign. A title that is descriptive and keyword-rich. Making sure your bullet points are descriptive and readable, clearly showing the product’s value proposition. Good, relevant back-end search terms. Having a proper, high-quality translation of your listing if you have the same product appearing in multiple Amazon marketplaces. Having a competitive price for your product. ACoS stands for Advertising Cost of Sales, and is Amazon’s name for the total cost of PPC advertising per product sold. It is one of the key metrics for measuring your campaign performance. The ACoS percentage is calculated by dividing your total advertising spend by the sales from your PPC campaign. For example, if you spent $5 on advertising and those ads resulted in sales of $50, your ACoS would be 10%. How much should my ACoS be? Your ideal ACoS depends on a number of variables relating to your product and your campaign goal. It’s different for every product, and can even vary for the same product if your goal changes over time. To drive additional sales and improve your organic search ranking, you might choose an ACoS that means you break even on each product sale. For a big product launch, you might choose a higher ACoS that actually loses you money on each sale but can be a long-term investment. For ongoing sales of a mature product, you might choose a lower ACoS to ensure that every sale meets a minimum profit margin. Cost of goods sold (COGS) – the cost of one unit when you purchase it from your supplier. Amazon selling and FBA fees for each sale. Miscellaneous costs such as shipping, taxes, duties, etc. Subtract all of your costs from your selling price to leave you with the profit per unit. Divide that by the selling price to find your break even ACoS. You can then adjust that higher or lower to match your goals. What is the best way to start with Amazon PPC ads? When you’re getting started with Amazon PPC, you have two basic choices – do it yourself, or use a tool or agency to do it for you. As an individual seller doing it yourself, I’d recommend running an Amazon automated campaign to start. An automated campaign will provide you with everything you need to get started without having to use any additional tools for keywords or advertising. Amazon will provide you with suggested keywords at a low bid price, and then you can see which ones convert into sales. Amazon does a pretty solid job with the keyword selection, and your ads will also show in your competitor’s listings as well as search results. Understanding different keyword match types. Setting your advertising bids and budget. Creating logical ad groups and campaigns. Fortunately for new PPC users, the platform is fairly simple compared to Google or Facebook. It’s a easy way to start with PPC, experiment, and learn on the fly at a relatively low cost of entry. Judolaunch has a number of resources that will be helpful if you’re new to PPC, including this blog post about the basics to get started. How do I generate keywords? When you’re running an automatic campaign, Amazon will generate your keywords based on your product listing and commonly used search terms – so you don’t have to do anything. If you’re running a manual campaign, you need to generate the keywords yourself. Use a third party Amazon keyword tool to find relevant keywords to your product. These tools will save you time, money, and effort while helping you create an effective targeted keyword list for your PPC campaign. Should I use broad, phrase or exact keyword match types? There are three keyword match types that you can use in your Amazon PPC ad campaigns: broad, phrase, and exact. Broad match will include your ad in searches related to the keyword, and can include quite loosely related terms. Phrase match lets your ad appear when someone searches for a relevant phrase that contains your keywords, including slight variations or misspellings. Exact match means your ad will only appear if the shopper searches for the exact keyword or phrase you’ve chosen. Broad match is useful for finding new keywords. Phrase match can help to reduce ad spend while remaining open to minor variations. Exact match works well to target very relevant keywords with higher bids. It is worth testing all three match types to find which one performs better for each keyword. Amazon includes a lot of factors when deciding which PPC ads to show, so the results can be surprising. For example, if Amazon estimates that the customer is ready to buy it will be more likely to show exact keyword matches. If the algorithm decides the customer is still in the research stage, it is more likely to show broad keyword matches. Coupled with the relevance and quality factors mentioned above in How does Amazon decide which ads to show and where?, the effect on your ad results can be hard to predict. Can I run both automatic and manual campaigns for the same product? It’s actually a common tactic to run both automatic and manual campaigns simultaneously. The manual campaign can focus on proven keywords and have higher bids, while the automatic campaign works as a research tool and has lower bids. Over time, the best keywords that arise from the automatic campaign can be transferred to the manual campaign. To make sure you are not paying for the same keywords in both campaigns, you can set the manual campaign’s bids higher than the automatic campaign. Another way is to add negative keywords to block your ad from appearing in certain search results. In terms of effectiveness, a manual campaign should achieve better results compared to an automatic campaign in the long term. The main reason is that you have full control over each keyword and can fine tune match types and bids. How long does it take for Amazon PPC ads to “warm up”? Every ad campaign has a “warm up” period. This is when Amazon is evaluating your campaign and product before letting it run free on the site. Once the campaign has warmed up the amount of exposure you are getting should then remain stable. Automatic campaigns usually start getting impressions and performing well within just a few days. Manual campaigns are a different story. Back in 2016-2017, it used to take only 2-4 weeks for them to warm up. Since Amazon’s changes in 2018, it now takes up to 8 weeks on average. Before that time, manual ad campaigns will not get enough impressions for you to make good optimization decisions. So, be patient and keep a careful eye on your metrics. Once your campaign has warmed up, experiment and adjust keywords and bids in the way that the data indicates. How much do I need to spend on Amazon PPC ads? There’s no one answer to this question, because it depends on your product, the competition in your category, your sales goals, and your profit margin. Here are some steps you can take to determine what the right number is for you. First, you’ll need to analyze your budget, and determine your profit margin. There are a number of FBA calculators, including Amazon’s own, to help you do this. Next, consider how competitive the product and category is, and how much of your sales are organic versus a result of the PPC campaign. Choose a predetermined spend and enter this into your campaign settings. Spend as a percentage of total sales (organic and paid). A typical ratio is 8% to 12%. Base your spend on your ACoS, starting with a low daily budget and bids, then gradually increase it until you reach the top of your acceptable range. Use the 25/25 Rule. In this model, you optimize for an ACoS around 25%, and try to have 25% of your total sales come from your PPC ads. The goal is usually to maximize profit, so experiment with these approaches until you find one where the math makes the most sense for you. Why aren’t my Amazon PPC ads showing up? If you’re not getting any impressions from your PPC ads, there are a few common issues that you can address to try and fix the problem. Check your listing and make sure every part of it is optimized. Adjust your keywords to include longer and more specific search terms. Change your keyword match types. Increase your bids for specific keywords. Amazon is a highly competitive marketplace, and you may find that a low bid is not going to give your campaign the visibility you need to get conversions. Your product is in the right subcategory. The campaign has been live for at least seven days. Manual campaigns have at least 300 keywords (and only use phrase match in the beginning). The keywords are relevant to the listing. If an automatic campaign is not having any impressions, Amazon may not trust your product yet. Zero impressions can also indicate that your ad campaign is blocked by Amazon. One tactic we see sellers practicing is increasing the daily budget by $1.00 every day or two. The theory is that regular changes have a positive impact on relevance and give campaigns more impressions. Why aren’t my Amazon PPC ads getting any clicks? If your ads are appearing but you’re not getting any clicks, it’s probably an issue with your listing. In this video we discuss five tips to improve your Amazon listing conversion rates. My Amazon PPC ads are getting clicks but no sales. What should I do? Make sure your pricing is competitive in the category. High prices might be scaring buyers away. Look at the quality of your listing. We can’t say this enough, but make sure it’s optimized to create sales with great photos, a descriptive title, correct keywords, and valuable content detailing the features and benefits of the product. If you are getting a high click through rate with few conversions, the problem is most likely your listing. Reviews play a part in this as well. 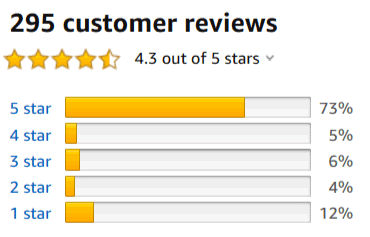 This is a big topic so I won’t go into detail here, but take a look at our post about how reviews impact sales for a lot of useful tips. Finally, be patient. How much time has passed? It may take a while for listings to begin to convert. If the age of your new PPC campaign is less than seven days you might want to wait a while before you start making changes. After all that, if you are still getting a meaningful amount of clicks but no sales, there’s a high chance that your product is just not good enough and you need to go back to the drawing board. How do I optimize my Amazon PPC ads, to get a better return? There are three main ways you can continue to tweak your Amazon PPC to get better returns. Cut wasteful ad spending by altering bids based on performance. Basically, you want to monitor the ACoS for each keyword. Reduce the bid on the ones with the highest ACoS to maintain profitability, and increase the bids on the ones with the lowest ACoS to increase traffic. Keep an eye on your highest spend keywords to make sure they are converting. If not, you need to optimize. Consider increasing the bids on your highest converting keywords. Run all keywords that are converting in all three match types so you can compare the performance of each. You can find keywords that convert by filtering your data reports to determine what your customers are searching for, and which keywords have good click through rates of 1% or more. In my experience 0.7% CTR is considered good, anything below is average, and less than 0.2% is bad. Also add negative keywords to prevent your ads showing for irrelevant search terms that you do not want to pay for. For each keyword, look at which of the match types has the best metrics. Keywords with badly performing match types should be optimized so they no longer spend your budget. Continue to adjust your keywords, including adding new ones. Ultimately, you want to keep an eye on your data and continue to promote the keywords that are performing and replace or remove the ones that are not. Adjust your bids accordingly to keep you ACoS in the target range. Also look out for the changes Amazon is making to ad placements and consider making changes to adapt to those. Once my product is selling, can I turn off the PPC ads? It’s best to always run PPC ads. You always want to get the extra sales from PPC, even if they are at break even or a slight loss. The extra sales increase sales velocity which is good for your organic search ranking. Should I run Amazon PPC ads myself or use an agency? While Amazon has a great deal of information available to help you get started, running a successful campaign takes time and knowledge, and many sellers don’t have enough of either to do it effectively. If you choose an agency, be sure they are reputable and have verifiable results. There are unscrupulous operators out there making dubious claims about their effectiveness. Can I launch a new product on Amazon without PPC ads? While you can certainly do that, you’ll get much better conversions and long-term ranking benefits by running your launch with a coordinated PPC campaign. Amazon PPC is a powerful advertising strategy that can generate big sales when done properly, whether you’re a veteran seller or just getting started. If you’re just getting started selling on Amazon and are interested in learning more about how to be successful, check out The Ultimate Beginners Guide to Selling on Amazon on the Judolaunch blog. Judolaunch has designed a new tool called JudoPPC to automate and manage Amazon PPC. JudoPPC is goal-focused Amazon PPC ad automation software. It allows a merchant to select a goal (maximize profit; product launch; ranking; liquidate inventory), then uses artificial intelligence to achieve that goal through a custom optimized Amazon PPC advertising campaign.